The food and rituals, I feel, are testimony to the synergy that Bengalis have towards their traditions. Not just Bengalis. Peep into the homes in your neighbourhood (not literally!) and you will see the Assamese, Malayali, Sikh, Tamil households busy cleaning house, prepping to greet guests and cooking up a storm. A sign of the earnest desire to cherish traditions. These are among the several communities in India that will be celebrating the beginning of their New Year on April 14-15. Over years, celebration patterns at the Bhaumick household have changed – new and old friends, thought processes, cultural programmes, the manner of rejoicing. Never the food though. There is comfortable excitement in the known – starting the day with a breakfast of luchi, aloo’r dum and begun bhaaja (fried bread, Bengali style potato curry with fried brinjal), followed by a lavish lunch of two appetisers, a dal, vegetable curries, fish curry, mutton or chicken curry, a few sweets and a must on New Year day, the payesh. Our New Year days don’t involve so much food anymore but we don’t miss out on the maangsho jhol (Bengali style mutton curry) and the payesh. I am not a payesh fan, being lactose intolerant. But I do make an exception for Khejur Gur Payesh. Made with date palm jaggery that is available in the winter months only, it is a Bengali speciality. So this year, I decided to learn how to make my favourite. And because New Years are about going overboard, I also learned to make Chhana Payesh – a milk pudding made with chhana or paneer. Chhana is a type of cheese curd; process it further and you get paneer. No Indian store nearby? Make chhana at home, the process is pretty simple as is evident in ‘Churning out homemade chhana/paneer’. The chhana payesh and khejur gur payesh are a must in Bengali households on special occasions. Both recipes require a dedicated hour – a difficult task in summer. Milk-based desserts, in my limited experience, require effort because there is a lot of stirring involved to stop the milk from burning or curdling. But all the effort is worth the final product. 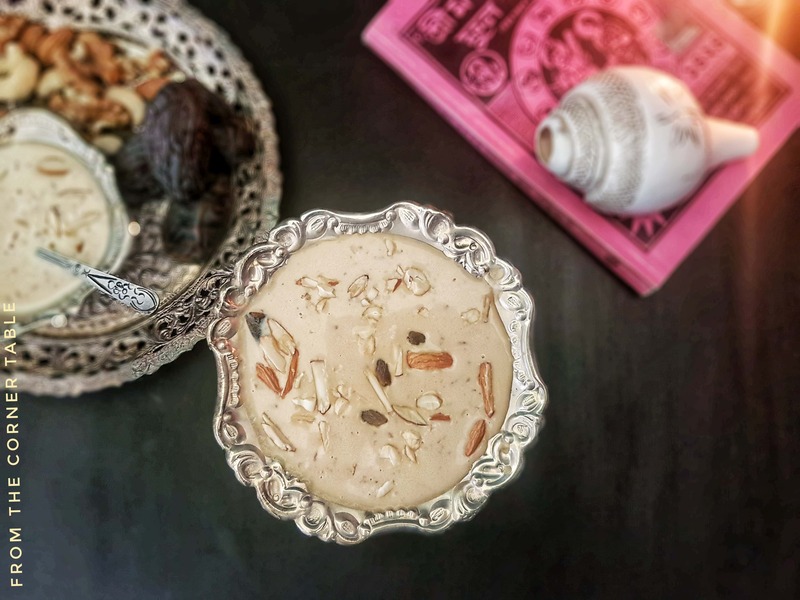 There are a few dos and don’ts that you need to keep in mind while attempting the payesh so do read the recipe notes and keep your ingredients handy before the cooking begins. Post photos of your efforts on social media, let the world marvel at your capability and don’t forget to tag From The Corner Table on Facebook and Instagram. A winter special from West Bengal, this creamy rice pudding is enriched with the earthy flavours of date palm jaggery. Wash and soak the rice in a cup of milk/water. Chop the jaggery into tiny pieces. Set aside both. Pour the milk in a saucepan or heavy-bottomed pan, place on low heat and bring to boil while stirring frequently. Allow the milk to boil for 10 minutes before adding the bay leaves; continue to boil till the milk reduces by 1/4th the amount. Stir frequently. Add the soaked rice to the milk and continue to boil for 20-30 minutes or until the rice is cooked. Keep stirring. Once the rice is cooked, add 1 tablespoon of sugar and mix well. Remove from the heat, add the jaggery and stir until the jaggery has dissolved completely. Add the raisins and stir. Serve warm or cold, garnished with chopped nuts. Gobindobhog and Basmati are varieties of rice renowned for flavour and fragrance making them the perfect choice for payesh. You can use any aromatic rice. Cooking date palm jaggery with milk is tricky due to chances of the milk curdling. This happens when the sap of the date palm tree has soured before it was used to make jaggery. Hence, the jaggery is not cooked and is added only after the payesh is removed from the heat. You can even do a safety test by mixing a bit of jaggery with a tablespoon of milk. A luscious and minimal milk pudding made with chhana (paneer); a comfort food for most Bengalis. Allow the milk to boil for 10 minutes before adding the bay leaves; continue to boil till the milk reduces by half. Stir frequently. Add 1/2 cup sugar, stir and bring to a boil. Allow the milk to boil for 5 minutes. Add the chhana/paneer to the boiling milk and cook for 20 minutes, stirring frequently. Add 1/4 cup raisins, give the payesh a quick stir, add the cardamom powder and remove from the heat. • Paneer can be easily bought from any Indian store in your city. According to my cousin sister, ricotta cheese could be a substitute. Or you could come back here tomorrow and learn how to make chhana/paneer at home. • Sugar does not allow a mixture to thicken or ingredients – like rice or vegetables – to cook. It is added at the end like we did with the Gaajar ka Kheer. But since the chhana is already cooked, the sugar is added earlier and then the chhana.